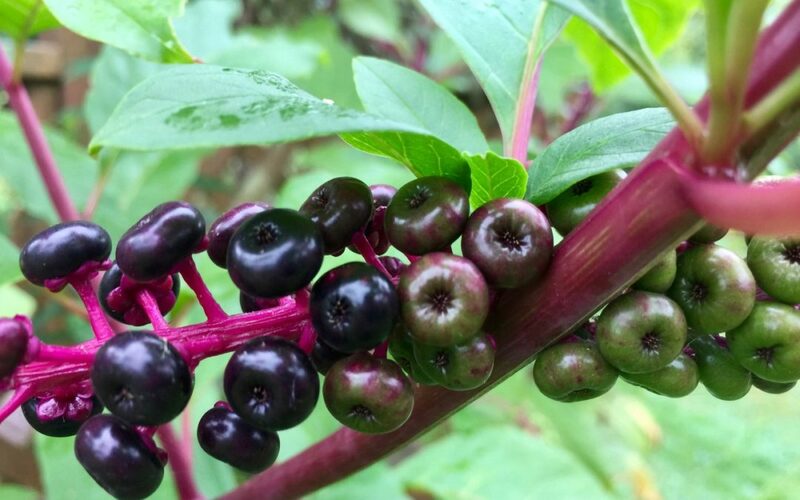 I first heard about pokeweed in one of my Facebook homesteading groups. Someone there had posted a photo of a plant like the one I had just noticed growing between our two little cabins by the pond. It seemed to spring up overnight and was over three and a half feet tall, probably. The gist of all the comments was that the stalk & leaves can be eaten (poke salat), but to be very careful how you prepare them because they can be poisonous. Of course, hearing the word “poison” and knowing how much my son loves playing by the cabins, I immediately asked my husband if he could please go dig it out (I’d also read that the roots grow deep). Then, of course, shortly after it was out and disposed of, I learned something really interesting about the plant – that the berries can be used to make a beautiful magenta-colored dye. Well shoot! There were no berries growing on the plant yet, so it hadn’t even crossed my mind that it might have some purpose. At that point, I’d already been scouring the property for signs of any possible dye sources, so I was a little disappointed in myself for rushing to eradicate the plant. But, no worries. 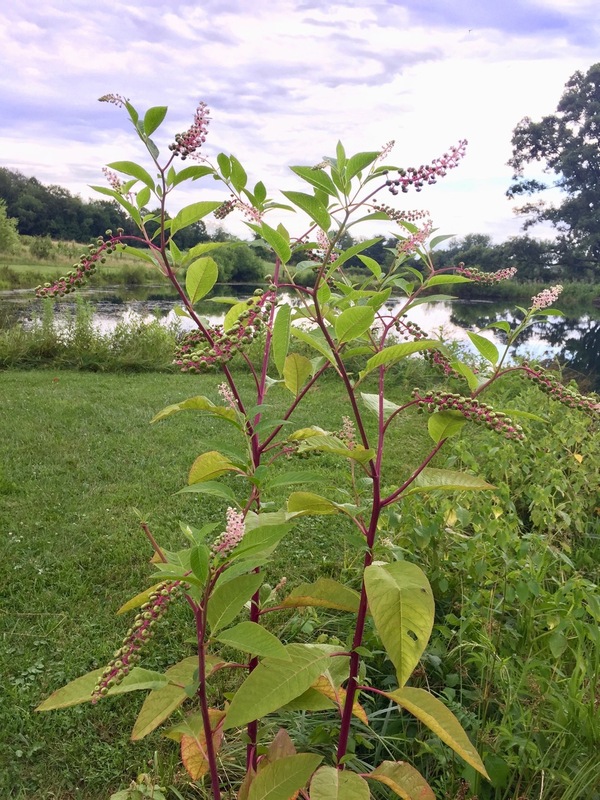 I forgot my despair about the missed opportunity a couple weeks later when I noticed several other huge pokeweed plants growing on the bridge to and behind the gazebo. Just yesterday, Tom found another large one growing up in the center of the overgrowth in our pond overflow area. So, that’s the good news! Now what I need to do is figure out how this is going to go down. It’s poisonous to eat, but what about touching & handling during the dye-making process? I figure I’d better wear gloves and play it safe, just in case. I don’t want purple fingers anyway. Right now the berries are still mostly green, but some have turned a beautiful deep (almost black) purple. Shades of red, purple or pink aren’t my favorite, but it’ll be exciting to experiment with this. I’d even like to see how a sample of dark brown & light fawn alpaca fiber comes out of the dye pot! After reminding myself that baby two is coming in about a week and that I’m also starting to learn how to clean & process our alpaca fiber and spin on a drop spindle, I’ve decided it’s best to just pick and freeze this year. That way the berries won’t go to waste and I also don’t get in over my head trying to learn too many new things at once (this seems to happen quite a bit).